Drugs in Psychiatric Practice present a comprehensive examination of the drug treatment in psychiatry. It discusses certain ways in which drugs behaved. It addresses the advances in pharmacology and the basis of prescription. 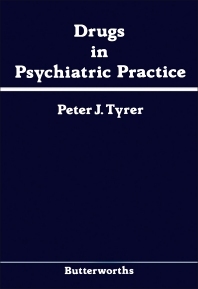 Some of the topics covered in the book are the classification of psychotropic drugs; basic principles of pharmacokinetics and drug metabolism; anti-schizophrenic drugs; evaluation of psychotropic drugs; unconventional chemotherapy; anti-parkinsonian and anti-dyskinetic drugs; introduction of amitriptyline; and tricyclic antidepressants. The role of tricyclic drugs in the treatment of enuresis and the drug treatment of organic brain syndrome are fully covered. An in-depth account of the monoamine oxidase inhibitors and amine precursors are provided. The tolerance and pharmacological dependence on alcohol are completely presented. A chapter is devoted to the factors involve in ethanol metabolism. Another section focuses on the unwanted effects of psychotropic drugs. The book can provide useful information to doctors, pharmacists, psychologists, students, and researchers. What is a Psychotropic Drug?